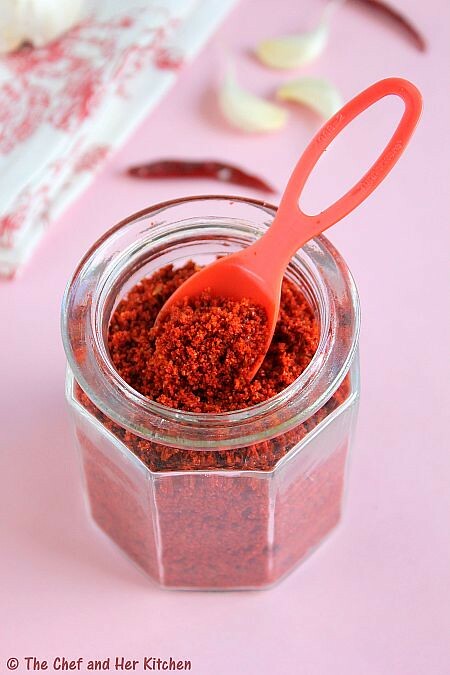 I always store this Garlic chili powder in my pantry which comes handy while making various curries and stir fries.It adds a nice hint of garlic along with the spiciness from red chillies.You can use this garlic chili powder in various stir fries,all you need to do is stir fry vegetables like ladies finger, tindora, brinjal, cauliflower, potato, arbi etc and add a couple of tsp of garlic chili powder at the end. Separate the garlic pods and remove the extra outer layers of garlic,you can keep one layer or you can even remove that completely or you can either remove the layers completely for half the pods and retain for the other half. Grind red chili powder,cumin seeds and salt to a powder. Add garlic pods and grind again to a coarse powder. You can sprinkle it for most of the Andhra style vegetable fries (vepudu), curries or you can even sprinkle this powder on dosa. You can increase the garlic pods in the recipe if you want more garlic.But too much garlic will also spoil the taste. Sprinkle this garlic powder when you make vegetable stir fries like Ladies finger, Brinjal, Tindora(Ivy gourd), Bitter gourd, Cluster beans , Carrot, Beetroot, French Beans, Cauliflower, Potato fry, Arbi fry etc.You need to saute the vegetables until done and add the spicy garlic powder as per your taste at the end. You can roast the whole slit vegetables like Brinjals, Ivy gourd and Bitter gourd(partially cooked in tamarind water) until they are completely done and stuff them at the end with this spicy garlic podi.You should make this just before serving,it tastes nice. 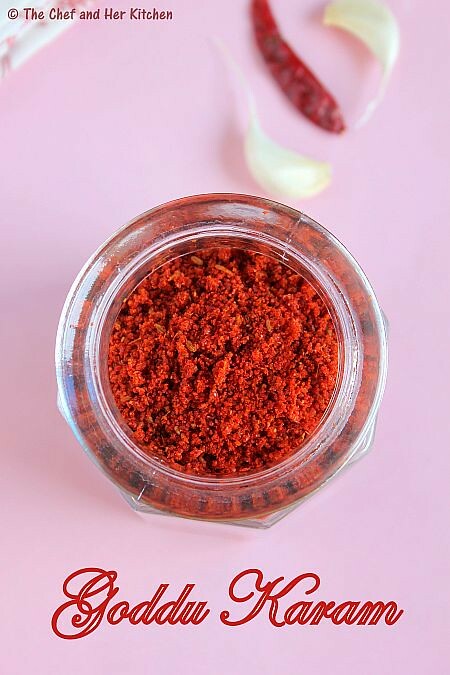 This garlic podi is a multi purpose powder,you can spice up your dals, regular dry curries, parathas with it. It can be even sprinkled on dosas or idlis. I love garlic based powders. My friends mother in law makes them for her and I generally have them when we have lunch together. Thanks for the recipe. Its nice to know what goes into the recipe. Love your blog & such interesting info on different spices! Hot and fiery podi, have to make some soon. love the color of podi, very flavorful. wowww....this looks amazing..treat to eyes..
very very tempting. Shall try next week. 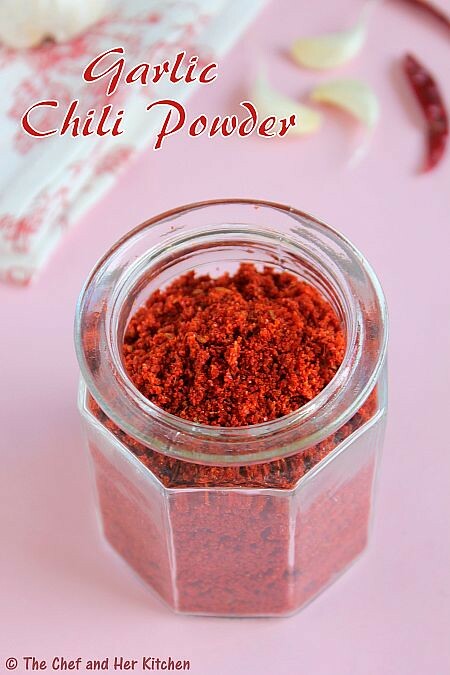 Truly a versatile powder and so easy to make.I make one with copra and garlic too> Pic is awesome. Recipe for drooling on the keypad! Looking for recipes to make vegetables without using coconut and looks like I am going to love this! I love the colour of the chilli powder. I have eat Indian spicy foods and this will give the raw Indian spicy taste to the dish. Drooling over the recipe and pic. What a beautiful tempting pic and color in it. how many days this powder lasts?